The primary purpose for food is nutrition, but it also has a human dimension. Diners choose what they eat not only by flavor or nutritional value but by cultural, religious, economic, status and environmental factors. In Inner Mongolia for centuries the staple traditional diet has been meat, milk and grain, mainly in flour form. This is because Inner Mongolians were pastoral herders, nomads who roamed freely on the vast grasslands, raising sheep, goats, horses, yaks and camels. Only in the last sixty years have they stopped wandering and settled down. Many now farm as well as raise livestock; others have left for jobs in the big cities. Additionally, in the early 1920s a great wave of Han Chinese immigrated to Inner Mongolia, causing culinary as well as economic changes. The Han people introduced diet variations among the Inner Mongolians, the most notable being the addition of more fresh fruits and vegetables. In the past people ate only a few native plants: wild spring onions, wild lilies, wild apples and a few herbs, such as thyme and lavender. Today Chinese classify Mongolian food into several categories: hong cai: red food -- meat; bai cai: white food -- dairy, grains and/or bing -- pancakes and finally huo guo -- Mongolian hot pot. All of these types of foods originated hundreds of years ago when the Mongolians led nomadic lives. In Hohhot there is also a special dish called Shaomai -- a local but ancient delicacy. This little flour pastry filled with minced lamb meat and onions is said to have been created to feed a passing army that arrived with very little notice. The dainty purses are fried on a shallow pan and then served with Shanxi black vinegar. The vast quantities of meat consumed here often shock visitors. For Mongolians meat is hearty food that creates necessary energy to fight off the long, cold winters. 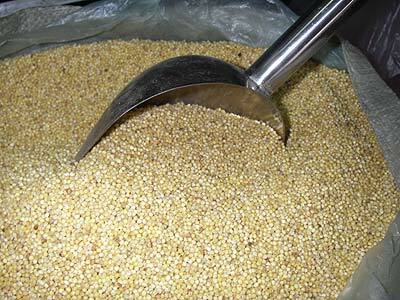 It is still the staple food in Outer Mongolians. As herdsmen Mongolians have always valued meat. Families consider their livestock animals as walking wealth and walking food sources. Mongolians do eat beef but the cow is considered more useful as a dairy source; mutton is the preferred meat. Traditionally a lamb was ritually slaughtered during the New Year and a red ribbon tied around his neck to commemorate the holiday. Today at banquets visitors often are treated to a whole roast lamb, called bukhel khoni. The meat entrée rests on a huge platter; it is carried in by burly Mongolian waiters and then deftly carved up. According to custom a small triangular slice from the lamb's head is cut and thrown into the fire. For Mongolians this action symbolizes the purity of fire and ensures that all the guests will have good relationships with each other. Some restaurants roast and then deep fry their lamb, adding to its tenderness and texture. The cooking style is actually Manchurian but it has been adopted by many Mongolians because it is so delicious. Borc shorlog is Mongolian Bar-B-Q: chunks of succulent roast lamb are slathered with spices and then roasted on skewers until done. You can find this on any street corner during a warm summer night by simply following the aroma of roasting meat and cumin. Shar luk consists of large chunks of lamb attached to bones which are boiled and served up hot. Inner Mongolian chefs insist that the meat be added to cold, unsalted water before the boiling process begins in order to ensure a tender but hearty taste. Wild onions and salt are later added to create stock. Bordsom gedes are sausages made from horse meat, cow meat, or camel meat. Chutgasan gedes are sausages made from the meat and blood of livestock animals. Milk, milk tea, milk wine, sour milk/yogurt, sour cream, cheese, dried cheese and butter are all food products found here in Inner Mongolia. Dairy foods are high in protein and minerals. Traditionally Mongolians relied on them rather than on more seasonable foods like vegetables and fruits. In the summer sour milk products are thought to clean the stomach. Many Inner Mongolians adhere to month long milk fasts in the summer. Dairy products are thought to soften and whiten the skin; ladies apply yogurt masks to their faces especially during the summer. Out of necessity Mongolians have found creative and ingenious ways to use the milk of all five of the domestic animals in the country: sheep, cattle, goats, camels and horses. Orom is the cream that forms on top of boiled milk; it is highly prized and very delicious. Airag is fermented mare's milk; it's a potent but manageable wine. Nermel is a kind of home-brewed milk vodka that resembles Chinese baijiu, very strong stuff. Tarag (Chinese suan nai) is yogurt. Shar tos is a kind of ghee made from curds and orom; it is sold in little glass jars labeled as "hwang yo" -- yellow oil. Today many delicious varieties of dairy products are produced exclusively in Inner Mongolia at the Mengniu milk factory. In some small home style cafes diners can find tsagaan tos, a Mongolian porridge consisting of boiled cream mixed with flour and natural fruits and a dried cheese called eesgii. Finally, there's sgtai tse, or nai cha as the Chinese call Mongolian milk tea; slightly salty but refreshing, this beverage is now sold everywhere in dried form but of course it is best fresh. 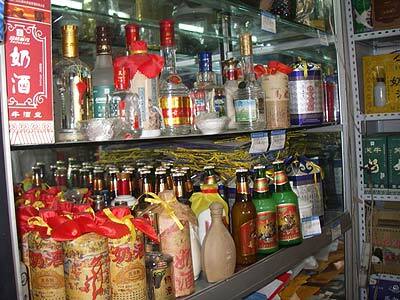 Dried dairy products are also plentiful throughout Inner Mongolia. 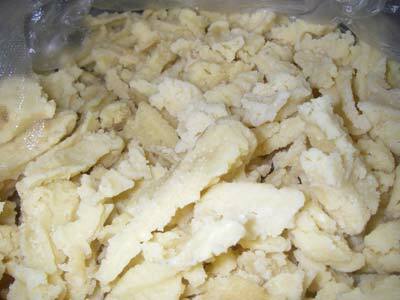 Aaruul are dried curds. During the summer it can be seen baking in the sun on top of Mongolian yurts in the Hulun Buir grasslands in the far north. Eetsgii is a very hard, dried cheese. Around Hohhot the Mongolian food stores also sell tofu block sized pieces of cheese that somewhat resembles western cheese. It's pungent and easily crumbles; this is bislag. 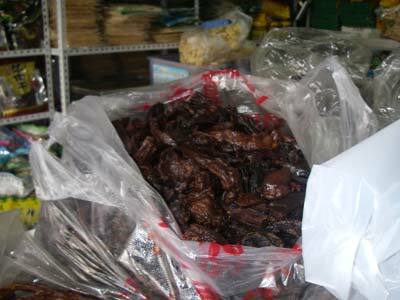 These unique dairy products are sold along with dried, seasoned jerky; Chinese: niu rou gar. Jerky is made from cow, horse and camel meat. Traditionally the Mongolians prepared dried foods to ensure survival during the long winter months, now factories produce these products for domestic and international consumption. Inner Mongolian cuisine isn't just about meat and milk: Inner Mongolians also consume cereals, barley, potatoes, natural fruits and plants native to the countryside. Wheat, oats, buckwheat and millet are popular grains because these hardy plants grow on the steppes and flourish in this cold, continental climate. In Hohhot restaurants serve a very popular dish unique to this province called "yo mian" -- it is made from both oats and/or buckwheat flour, and served as a cold dish with cucumbers and sauce. In most restaurants one may also order "wu wu" -- the term for oat noodles rolled into little circles and cooked in a bamboo steamer. Noodles here come in diverse shapes, from shells to fettuccini. Potatoes also thrive in this chilly climate. Hohhot restaurants serve a tasty cold dish made from cold mashed potatoes mixed with baby wild onions. Barley porridge can be eaten for breakfast or lunch but traditionally Mongolians have uremtei khool: toasted millet mixed with yogurt and/or sour cream, and then sprinkled with sugar. Shar Bing: A large round flour pancake stuffed with minced meat seasoned with garlic or onion (it can be anything from mutton to beef to camel to horse) and fried on a grill. Bansh: A dumpling like delicacy, mixed with minced meat and onions or, it is covered with flour and steamed in boiling water. It can also be fried in oil. This is very similar to the Chinese jiaozi but much meatier. Hot pot is known around China and the world. Fast, fun and healthy, diners sit around a boiling cauldron of broth divided into two parts: a bland soup and a spicy soup. Guests select from dozens of foods: ranging from shaved lamb to chunks of fish, sliced root vegetables and leafy greens, exotic innards, tofu and animal parts. Everyone chooses something to add to the pot. The food quickly cooks and diners enjoy reaching into the communal cauldron to retrieve a delicious morsel. It is not hard to imagine nomads on the steppe boiling up their dinner among friends as the stars flicker gaily above them. Mongolian restaurants crowd against each other along densely populated side streets. To find them simply follow the aroma of lamb wafting through the air. If you want a truly luxurious dining experience, complete with Mongolian artifacts and a table in an authentic Mengggubao (yurt) the Bai Yin Khor Va restaurant is not to be missed. Bon appetite!